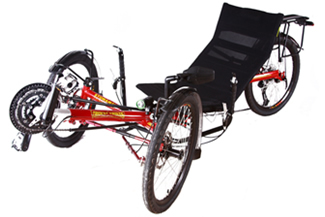 In addition to the Chameleon Convertitrike, Trident Trikes also offers 2 Folding Single Trikes- The Stowaway I & Stowaway II. Both offer an incredible component mix at a value price. Both Stowaway models use our Powder Coated Aircraft Quality 4130 Cro-Moly Tig Welded Frame, as well as Avid Brakes/ Promax Levers with Parking Brake, Double Wall Alloy Rims with Kenda Kwest 100 psi Tires, and Ackerman Compensated Crossover Steering, but that is where the similarities end. The Stowaway I is our Base Model. It uses a Microshift Front Derailleur and a SRAM X5 Rear Derailleur. Shifting is done with SRAM X5 Gripshifters.The Brakes are Avid BB5’s .The Seat Frame, handlebar, and Boom is also made of CroMoly and are both powder coated. The Stowaway II is our High Spec Model. It uses a Microshift Front Derailleur and a Shimano Deore Rear Derailleur. Shifting is done with Bar End Shifters.The Brakes are Avid BB7’s.The Crankset is a High End Forged Crankset with CNC Machined Rings, and an Integrated Bottom Bracket. The seat frame, handlebar and boom are Sandblasted and Anodized Aluminum Alloy. For all you Short Crank Afficianados, the Stowaway II will also be available with 160 mm Cranks for an additional $60. As with all Trident Trikes- we don’t charge you for the extras!! 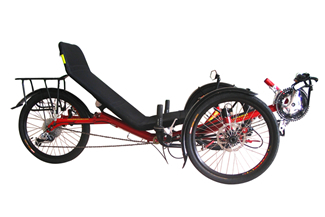 Also included with both models are a Rear Rack, a full set of 3 Fenders, a Safety Flag, a Mirror, and Front and Rear Lights.